Of course, the Saturday night 'entertainment' is criticial to the LOW END storyline. 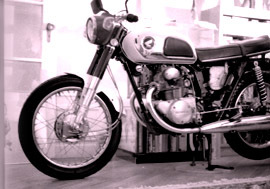 The first motorcycle to call apartment 6C "home" was a 1971 Honda CD175 found in a backyard in New Rochelle. It was pretty much toast when brought up in the elevator, but was painstakingly disassembled and rebuilt over the course of a winter. Nights were long back then. 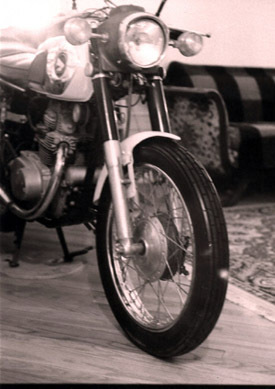 This motorcycle today resides on a shelf (truly) in the home of the author. The machine was fired once and run, however, a registration was never found for it. It is now a great conversation piece! Note the Raask rear sets and low-set handlebars. This puppy was meant for something grander than its displacement would suggest! It was actaully a very docile, nice litttle machine on its one foray. Well, there are some pictures of the apartment at 498 on the Gary's World page, but here is a more complete tour--with some added content. Here's for having a couple of beers leaning against the motorcycle. 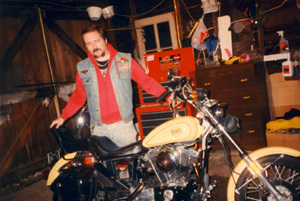 This picture was taken a night or two after the bike was retrieved from New Rochelle. Huge--I mean HUGE--spiders were living in the machine. One especially gnarly, hairy brute was living under the seat and decided that running up the human's arm was a great escape route. It wasn't for the spider and it almost triggered a heart attack for the human! 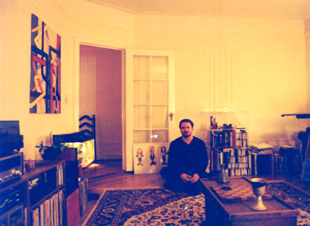 On the living room walls were two abstract modern paintings. One is visible here over the aquarium. Picture dates from 1987 as the oak book shelf has not appeared next to the drawing table. 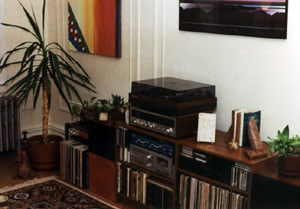 Over the stereo there was a seragraph of the California coastline created by a Japanese artist. The corresponding piece to the graphic opver the aquarium can be seen here over the plant. 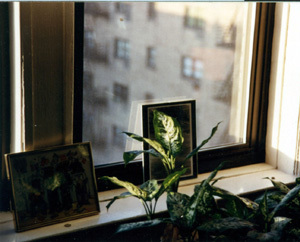 Here is a view of the apartment building on the opposite side of Van Cortlandt Park Avenue as seen from one of the southern windows of the bedroom. Here is a shot of the building across Van Cortlandt to the north. It was from in those windows that the Saturday Night 498 crowd witnessed the alleged crime that finally made everything click in Gary's head. When the little 1971 Honda proved unregisterable, a new machine was sought. 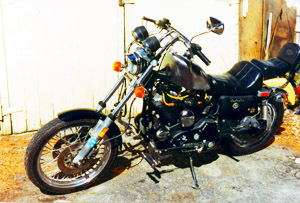 This came in the form of a 1981 Harley Davidson Sportster. Of course, stock is never good enough, customization was definitely required. Easy Rider (the movie) has influenced everyone born before 1970 and a semi-chopper look was desired. The bike went through an evolutionary series of changes, most being executed in a bath tub or on the kitchen floor. Now I am not recommending that motor vehicles should be stored, restored or customized in one's apartment, but it sure is nice to have all the facilities and the stereo close by while working. Heat is nice to have in the winter as well! 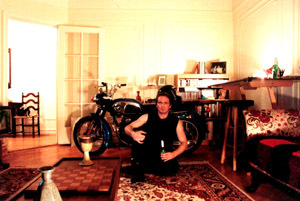 Here is a shot of the infamous/famous great guy and good friend Steve DeTone, the character Sloane DeLonge in LOW END. 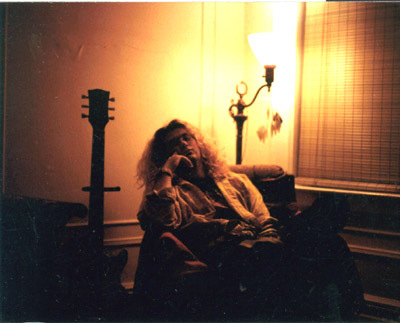 Sloane is seen here relaxing in an armchair at 498 New Year's Eve 1988/89 We all worked in Scarsdale in those days and many photos were taken by the amateur photographer in the ranks. 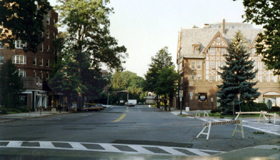 In Scarsdale, nothing is ugly. 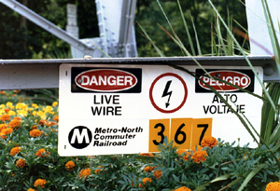 Check out what the town used to do with the Metro North high voltage towers... And of course, no mention of this area of Westchester would be complete without a brief look at our biggest edifice, the Kensico Dam. 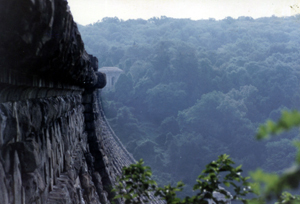 Located north of Scarsdale in North White Plains, just before Valhalla, the dam is remarkable in that up until 9/11, one could walk all over it, take pictures... I'm sure the security is much tighter now. Pity, it is a very photogenic spot and neat to hang out at. 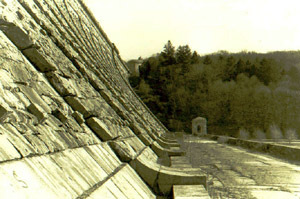 I lay across the stones at the top of the dam and dangled my camera to get this shot of the dam. I have never seen it photographed from this angle. 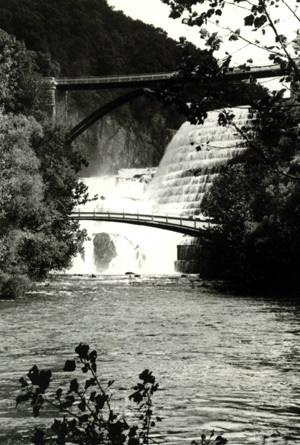 And, as only slightly mentioned in LOW END, here is Croton Gorge. Scotia's Harry Pellegrin knows music. He began taking piano lessons at age 5, switched to bass at 11 and took up guitar at 13. 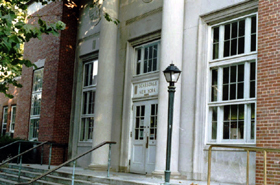 He graduated from Manhattan's Mannes College of Music, and played in several rock bands in The Bronx. So when Pellegrin began writing a novel, it was no surprise that he turned to the world of music. His first novel is "Low End," a rock 'n' roll mystery featuring disillusioned NYC rocker Gary Morrissey, who finds himself entangled in a murder investigation set amid the back alleys and dive barrooms of Yonkers. 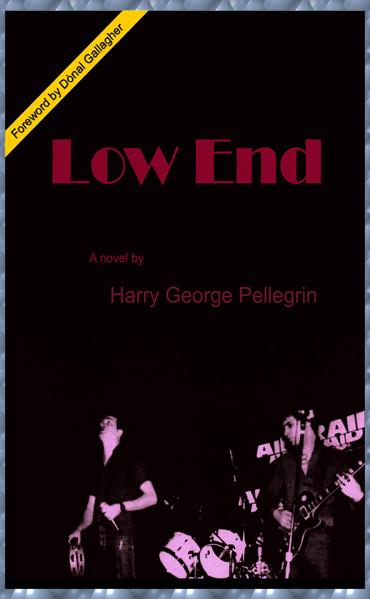 "Low End" won't land in stores until February, but you can buy a copy online (http://www. pellegrinlowend.com). Or better yet, drop by Starbucks on Clifton Country Road in Clifton Park between 4:30 and 7:30 p.m. Saturday, where Pellegrin is conducting a book-signing session. Like the book? Leave a review at www.authorsden.com, www.barnesandnoble.com, www.allreaders.com or at the following sites! Find LOW END plus other New and Used Books Here! Copies Are Now Available Through This Site!! !